I made a horrible decision as black in a game, and I do not understand why it's incorrect. I played c4, Stockfish considers the position to be + 0.4 after the move. My reasoning: I forever block white's bad bishop behind his blocked pawns, while keeping my good bishop. Since I gain a tempo on the queen, I can move my queen right away to be able to answer the break b3 with b5. I am also thinking that my position is much better, as white has a hole on e4 and I don't have such a weakness, so I thought I'd capitalize on my advantage by closing up the position. 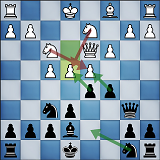 Stockfish considers this move to be a really poor move, e6 leading to an evaluation of -0.7. I've had this several time, and it's unclear to me why my move is bad, even though it gives me an inferior position from a superior one. Is it always bad to close up the position this way, or is it specific to the position ? Why is it bad, because I forever lose my main pawn break ? Or because my "good bishop" has no target and is therefore not really good ? Good question! The positional priorities in this position do not really lie in whose bishop has more prospect, but rather in the emerging pawn structure, potential pawn breaks, and either sides' ability to create targets and holes in opponent's camp. Left: Immediately undermining c4 defense after Qe2, Nbd2, if black takes, c4 is dropping soon and both knights will be well established centrally. And if black tries to sit still, e4-e5 is a threat, leaving black's kingside heavily undefended and white's pawn push is quite straightforward, black will lack space and the ability to create a counter-attack. 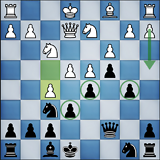 Mid: Black prepares for the immediate b5 (with Qc7) in order to reinforce c4 which leads to: Qe2, Qc7, Nbd2, e6, e4, b5, f5! and soon followed by a4. Notice how white's perfectly undermining the entire pawn backbone (e6, d5, b5) of c4. Right: Black simply tries to stop e4 by blockading it with a knight, but since it cannot really be followed up by f5 (as shown in the diagram), it will easily be challenged with Nbd2 after which black either has to take on d2 which revives e4 again, or lets white take on e4 leaving ton of light square weaknesses behind along with a permanent knight post on e5. 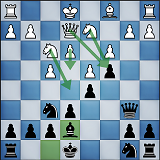 Note that in this structure, black has no prospect for ever landing a knight on d3, leaving the light square control that the overly advanced pawns have secured virtually unusable. Finally, notice that in neither of these cases, black's left with any form of initiative or targets in white's structure to allow for any counter-attack. Lastly, by not playing c4, you can still entertain a timely resolution of the central pawns in order to either simplify or create weak points in white's centre. And to connect with our discussions, by holding still with the pawn on c5 you are actually stopping white's e4 push as after say: e6, Nbd2, Be7, e4 you can simply take both on e4 and d4 not allowing white any central control (unlike the case of c4 where white always had clear spatial advantage), and your structure is devoid of weaknesses, if anything white will be the only side with potential dark square weaknesses. And if white recaptures on d4 with the pawn, then it's a comfortable IQP structure with an easy play for black. First of all, your plan of keeping White's queenside blocked doesn't quite work out in any case: After e.g. 1...c4 2. Qe2 Qc7 3. b3 b5 White can simply continue attacking your pawn chain by 4. a4 and you cannot answer 4...a6 because of 5. axb5 axb5? 6. Rxa8. If you try to protect the rook by 2...Qc6, White can insert 3. Ne5 to displace the queen. The blockade is not complete anyways, as the Bc1 can always escape its own pawn chain via a3. 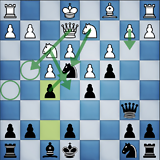 The move 1...c4 is very committal, 1...e6 on the other hand keeps all options open and even adds some more by supporting the development of your kingside. Crucially, you can now answer dxc5 by Bxc5, and since e3 would become super weak, White is discouraged to take on c5 anytime soon. The option of playing ...c4 thus won't disappear after 1...e6! But in the meantime, the pawn keeps up pressure on the White centre from c5, pressure that an immediate ...c4 loses. In this light, you'd like your queen to stay on b6, too, where she eyes both the g1-a7 diagonal as well as b2. White's "bad" bishop is already locked behind his pawns, you move doesn't change that, it's a feature of the opening he plays. Long term he could go for Bc1-d2-e1-h4, or play b3 and Ba3. In fact in your proposed line of 1...c4 Qc2 2.Qc6 3.b3 b5, he has 4.Ba3. Note that if you don't play ...c4, Ba3 sometimes fails to ...cxd4 cxd4 Bxa3 Nxa3 Qa5+ picking up the knight, but if you play ...c4 white doesn't have to think about that possibility. Similarly, your "good" bishop is already good. But it doesn't gain much from ...c4. You have a good square on e4, but if you put a knight there then white will exchange it for his and there will be a pawn on that square. If he plays Ne5 and you exchange it, he can take fxe5 and get an attack over the f-file. You removed the tension (white doesn't have to care about the option ...cxd4 anymore) and now have few good pawn breaks (I don't think ...f6 and ...e5 is going to work soon). If one the other hand white manages e3-e4, then your pawn on c4 may become weak. Or he can attack it with b3 and a4. Or go for a kingside attack with g2-g4. So I don't see your points. That said, 0.7 is more of an advantage than I had expected, maybe there is a way for him to force you to waste some more time, or win a pawn? The other answers were great, but I think you could sum it up like this : the player who has built the stonewall is looking for a locked center so that he can benefit from the time to build up an attack on your king, funneling his pieces over in the vicinity of your king without having to worry about central counter-play. Doing c4 might superficially look like gaining space, but it really helps the opponent in keeping the center locked, by giving up a possible break which might be needed. ...c4 is generally bad because it releases the tension on White's d4-pawn. This makes it much easier for White to get away with pushing e4, since the e3-pawn doesn't need to support the d4-pawn anymore. You're correct that White does have a weak hole on e4, but after playing Qc2 and Nbd2, he's ready to push e4 and gain a central initiative. Not the answer you're looking for? Browse other questions tagged strategy positional-play closed-position bad-bishop or ask your own question. Continue the Attack, Or Meet the Positional Threat?